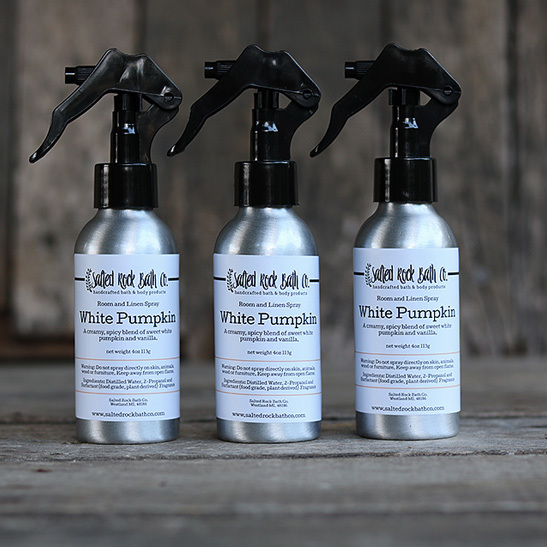 White Pumpkin Linen Spray – Salted Rock Bath Co.
Our room & linen spray are Vegan, non GMO, formaldehyde free, Cruelty Free, Phthalate free and soy free. Spritz throughout your home, in your car, or anywhere that needs a little freshening up. The scent: Sweet white pumpkin & Spices. Our room & linen spray are Vegan, non GMO, formaldehyde free, Cruelty Free, Phthalate free and soy free. Spritz throughout your home, in your car, bedding, furniture, or anywhere that needs a little freshening up. Customers enjoy using the spa fragrances as pillow sprays. Our new trigger sprays come locked with a small plastic pin. Just pull out the pin on the neck, and spray.